Last month, we took on some of the most impressive fortresses of ancient history… and we totally won. What? We did, just look. We aren’t content to just rest on our laurels, however–there are more imposing strongholds to dunk on with our unparalleled amenities and convenience. 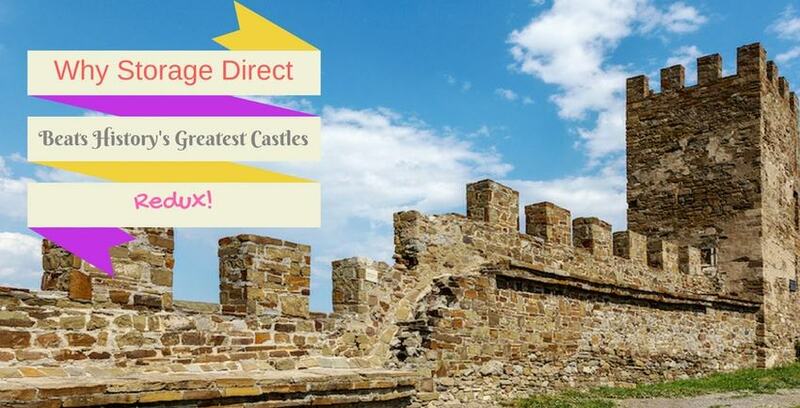 Plus, we’re pretty into researching ancient fortresses. History is awesome– especially insane history. As you’ll see, strongholds are like a magnet for that kind of history. Hey, another way we’re better than strongholds! What’s good again, storied history of man’s inhumanity towards man? Scotland’s most-visited tourist attraction and quite possibly the most famous castle in the world, Edinburgh Castle’s features read like a Dungeon Master’s dreamt-up super castle. First of all, people have lived there since the 2nd century, and a castle has been there since at least the 12th. The castle is built at the top of a mountainous cliff overlooking the sea from a height of 430 feet. Oh, yeah, and when we say mountainous cliff, we actually mean the plug of an extinct volcano that’s 350 million years old. It’s called “Castle Rock.” Yeah. That’s just the freaking rock this thing is built on! The peak isn’t just for show, either. The steep cliffs make Edinburgh Castle unassailable from any direction except East. So, of course, the east side is where all the really scary stuff is, including a highly-defended portcullis, several barracks capable of housing over 600 soldiers, two battery towers (one of which was destroyed), and several defensive entrenchment structures. That’s just the lower ward. The upper ward, accessible to attackers only through “the Foggy Gate” contains another battery tower, another gun tower, and of course “Mons Meg,” the 13,000-pound cannon. Naturally the castle has a suitably bloody, Scottish history. At least 26 sieges were fought here, making it the most besieged castle in Great Britain and possibly the world. It was featured in the Battle of Alnwick, both Wars of Scottish Independence, the Marian civil wars, the Bishop’s wars, and the first and second Jacobite uprisings. It served as a war prison during the Seven Year’s War, the American War of Independence, the Napoleonic Wars, and both World Wars. Literally countless people were killed, maimed, imprisoned, murdered, executed, or married here, including several Kings, Queens, children, and Child-Kings. Now, there are a couple nice gift shops. Go figure. Remember that bloody history we mentioned? Let’s go over some of the bullet points we’re pretty sure definitely resulted in some primo hauntings. We’ll start with the mild one: Saint Margaret apparently died of a broken heart after hearing of her husband’s death there in 1093. Not grisly, but she and ol’ Malcolm III are definitely still chilling around the castle. Oh, and Mary, Queen of Scots had Margaret’s head moved back to Edinburgh to help (?!) her give birth. Probably the biggest smoking gun of all, haunting-wise, is the tragic tale of Janet Douglas, Lady of Glamis. Douglas was imprisoned within the walls of Edinburgh castle and charged with practicing witchcraft. Her servants were tortured until they “confessed,” and then Douglas was burned at the stake while her young son watched. Edinburgh. Do you want ghosts? THAT’S HOW YOU GET GHOSTS! Honestly, we could write a whole article on all the ghost story material going on in Edinburgh castle–including a “Black Dinner” that Game of Throne’s infamous “Red Wedding” was based on!–but you get the picture. Thar be ghosts in that castle. At Storage Direct, on the other hand, we have yet to encounter any vengeful, ethereal apparitions with unfinished business at any of our many facilities. Sure, sometimes we hear a strange noise or two late at night, but that’s just the wind. It’s just the building settling. …Right? According to legend, the Justanid ruler Vahsudan was on a hunting trip when he saw an eagle soar over him and perch on a high peak. Justanid chose this peak as the site of a fortress. He named the fortress “Aluh?m?t,” meaning either “Eagle’s Teaching” or “Nest of Punishment.” Castle Alamut lives up to its lofty (heh) title. Positioned on a narrow perch almost 600 feet high, the fortress is shielded by mountains and rivers to the East and 1200 foot cliffs to the West. By 1090, the castle had already cultivated a legend as unconquerable. The Niz?r? Ism?’?l? rebels had to overthrow its Justanidian occupants not through bloodshed, but through meticulous plotting. Im?m Hasan ‘Ala Dhikrihi al-Salam snuck into the Alamut region disguised as a schoolteacher. He and his supporters built secret settlements and began to gather supporters. Hasan himself entered Alamut castle and gained the support of the soldiers inside. When he finally revealed himself, then-ruler Mahdi tried to have him seized, only to be seized himself. Hasan let Mahdi leave, and even paid him for Alamut castle before kicking him out! Once Alamut belonged to the Niz?r? Ism?’?l?, they re-fortified it, making it an even more imposing fortress. The Niz?r? Ism?’?l?’s additions to Alamut castle included limestone storehouses and secret cellars for additional provisions, so that the castle could be completely self-sufficient. Hasan also built a fabulous library, complete with rare artifacts and astrological tools, which attracted scholars and scientists from around the world. Under the Niz?r? Ism?’?l?, Alamut became not only a fortress, but a center for civic and intellectual development. Also, the word “assassin” was invented to refer to the warrior sect who lived here. Which is actually the scariest thing we’ve ever heard. Except for that birthing head thing from Edinburgh. With its impressive storehouses, Castle Alamut seems like it hits most of what Storage Direct has to offer, huh? Plus, it has over a thousand years of fascinating, provocative history and legend, it’s one of the most striking and impressive structures in the world, yeah, yeah. Makes you want to read about the no-doubt world-changing works housed in Alamut’s ancient library, huh? At Juvayni’s direction, most of the important treatises on Ismaili faith were lost forever. Juvayni was also the only historian to chronicle this period of Ismaili-Alamut history (he had the other chronicles burned, after all, which is an admittedly creative way to ensure job security), so historians may never have a complete picture of the rich history of Alamut and the Ismaili’s who once ruled there. History was literally written by the victors. Well. The victors and Juvayni, who just kind of hung out with the victors. There’s another victor who’s writing history: it’s us, right now. See how we’re writing that we’re better at storing things than Castle Alamut? No Mongol hordes are going to come and burn this blog down, and they won’t take any of your valuable artifacts (or your record collection), either. Catch these hands, Juvayni! There you have it: two more wonders laid low before the logistical might of Storage Direct. If you need a fortress to store your valuable in, find one of our many locations today. Whether you need temperature-controlled storage, a lot of room, or 24/7 access, we’ve got you covered. We’d like to see one of these genius castle-raisers or historical icons manage that!